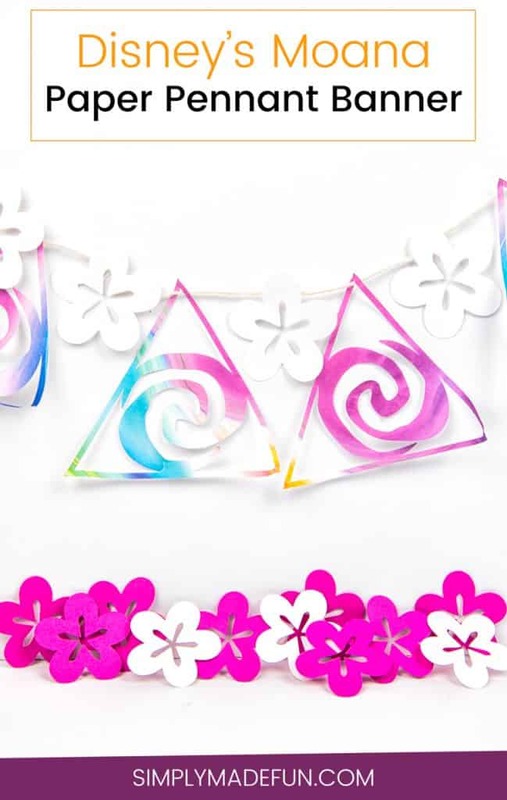 This fun and easy Moana paper pennant banner is the perfect decorative piece for a Moana themed party! I’m a bit ashamed to admit I haven’t seen Disney’s Moana yet. I want to and it’s definitely on my must-watch list, but Chris and I just haven’t had the time to get to the theater lately. I’ve heard it’s really cute though! And if the lines to meet Moana at Disney’s Hollywood Studios last week were any indication, this movie is sure to be awesome. With all the hype surrounding it I can only imagine all the little girls who will want Moana themed parties this year. I’d want one just for the pineapple and pulled pork I could eat (yum!)! But I’m sure most kids don’t dream of the food they could eat at their parties, which is why I made this Moana paper pennant banner! Because I could just see this hung up over the food table, which is right where I’d head as soon as I walked in the door. On Sunday I finally upgraded my Silhouette Portrait to the Cameo 3 (yay!) and couldn’t wait to make this Moana paper pennant banner with it. It was the perfect first project to do because it was so easy. Plus the watercolor paper I found at Joann’s is super pretty and goes well with the theme of the movie. I mean, don’t you think of gorgeous sunsets and crystal blue oceans when you look at the paper? I know I do! 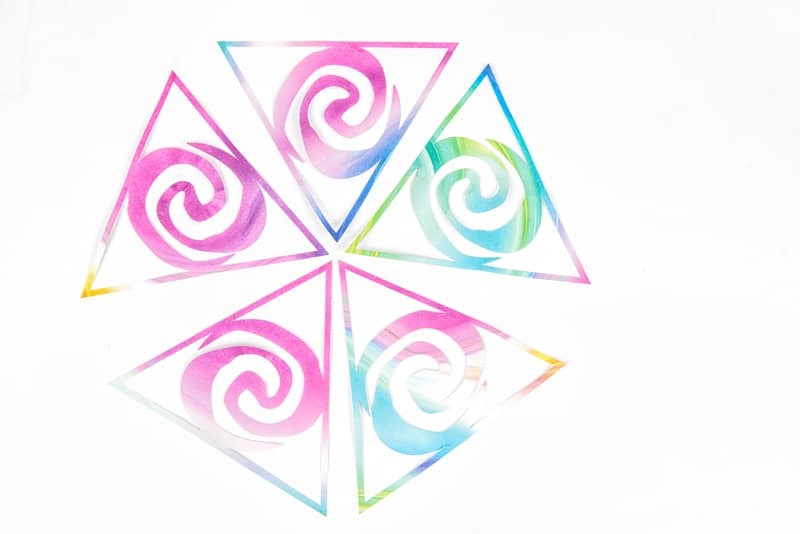 I decided to use the main symbol from Moana as inspiration for the banner and use the triangle shape as the base. I really wanted a pennant banner and this came out way better than expected. The only thing I’d change is using thicker paper because the watercolor cardstock that I used was so thin and tore really easily. Other than that though, this Moana Paper Pennant Banner came out so cute! Learn how to easily make your own Moana Paper Pennant Banner! + Using the octagon tool, draw a shape. Change the amount of sides to 3 to get your triangle. + Offset the outer triangle (anywhere between 0.2 and 0.3 will work, though you could go bigger if you want!). + Drag the Moana symbol into the Silhouette Software and trace it. Drag it into the center of your triangle and make sure that the sides overlap a bit. + Once you get the symbol where you want it, select it and your inner triangle and hit MODIFY > SUBTRACT. How easy was that? Have you ever used the subtract tool before? I discovered it recently and now I use it all the time! Are you or your kids Moana obsessed? 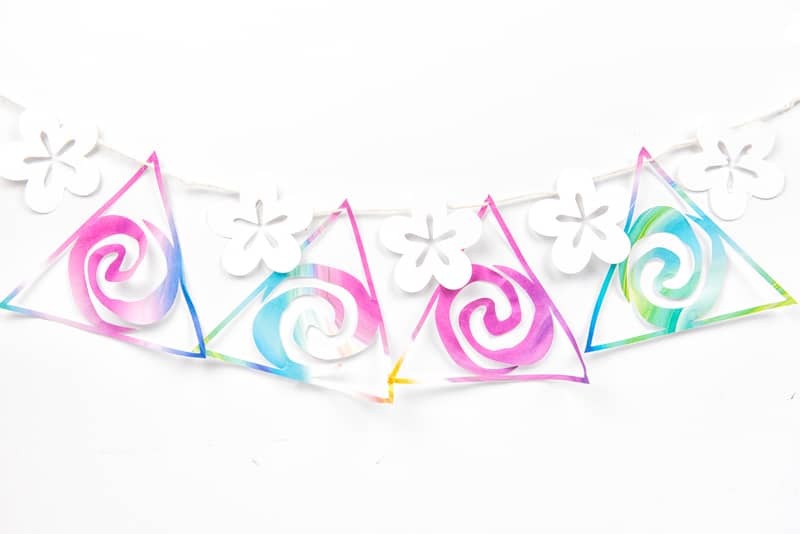 Would you decorate a kids party with this Moana Paper Pennant Banner? Check out these other Moana inspired recipes and crafts to celebrate the DVD release!